E.S. 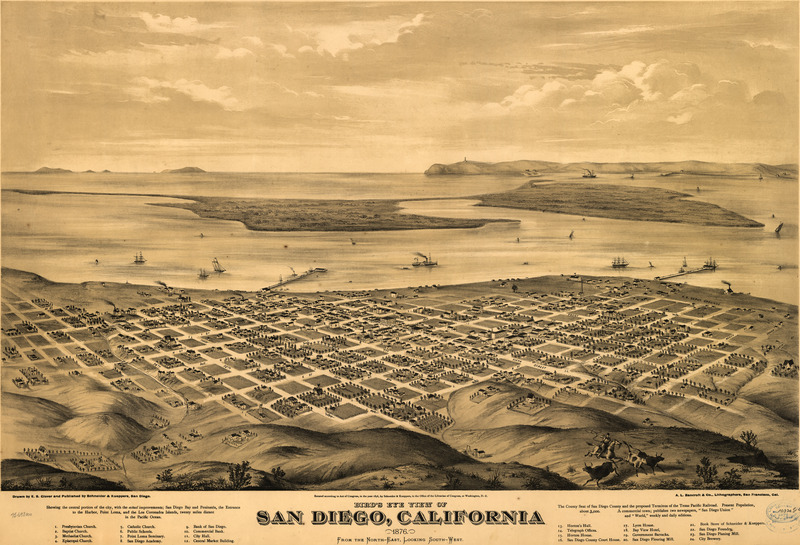 Glover's birdseye map of San Diego from 1876. Glover's San Diego [gmap] looks sleepy and fun. It's very strange to see (what I'm assuming is) Coronado in an unused state. Looks like a fun place to be. K and L streets no longer exist between 7th and 10th; this is the location of Petco Park (the Padres baseball stadium, built circa 2004) and 8th and 9th streets end at J. The map also shows streets existing in Horton Square (between Broadway – then D – and G and between 1st and 4th. I don’t know when this occured, but sometime before the 1970s these were demolished and a high-rise shopping center now stands there. I street was renamed Island, H was renamed Market, D renamed Broadway, M renamed Imperial, and 12th renamed Park. Today there is a large commuter rail terminal at Park and Imperial (12th and M) with tracks running up Park (12th) and across C to the Amtrak train station and northward. The train station is located between B and Broadway (D) about two blocks west of State (there are five more streets not shown here in modern times; sequentially India, Kettner, California, Pacific, Harbor. California was closed to traffic long ago and the train tracks run down it (the Amtrak train station’s entrance is on Kettner). Also the tree-named streets (in modern times) continue about halfway to Old Town with alphabetical names up to Walnut. And yes, the large flats is Coronado; this is dated before the building of the hotel or anything else out there. The bay in the center was eventually filled in; the portion to the right is now the naval air base. On the horizon behind it you can see Point Loma (which in fact is a raised ridge upon a peninsula, as shown) and the lighthouse, which is still standing (in modern times, it’s a museum run by the National Park Service). The pier shown to the right is in about the right place to be Navy Pier, which was the main supply point during WWII and is now the home of the Midway (aircraft carrier) Museum. The left-hand pier is in about the location of the modern Convention Center and the ferry dock, so I’m not sure what that was back then, since there was no ferry then. Also note the lack of Spanish influence; this is because this is “New Town”. 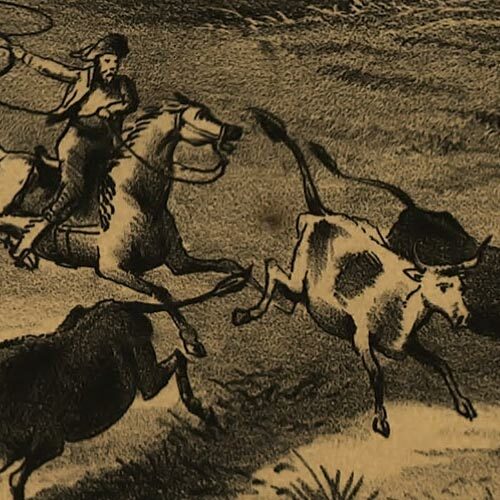 The City of San Diego itself was relocated at about this time (the arrival of the railroads). “Old Town” is off to the side of this map by two or three miles, which explains its survival. (Today, Old Town is a state park located on the other side of the airport from Downtown.) In fact, this map was probably made during the relocation, which would explain the sleepiness.